Enjoy nine days on an Egypt tour which features many of the region’s most precious and important heritage sites including the Sphinx and Great Pyramid as well as the treasures on show in Cairo’s Egyptian museum. A sleeper train to Aswan takes you to the Philae temple via the Aswan High Dam with optional trips to the UNESCO site at Abu Simbel adding to the adventure of spending a couple of nights on the Nile and cruises on-board a traditional felucca. 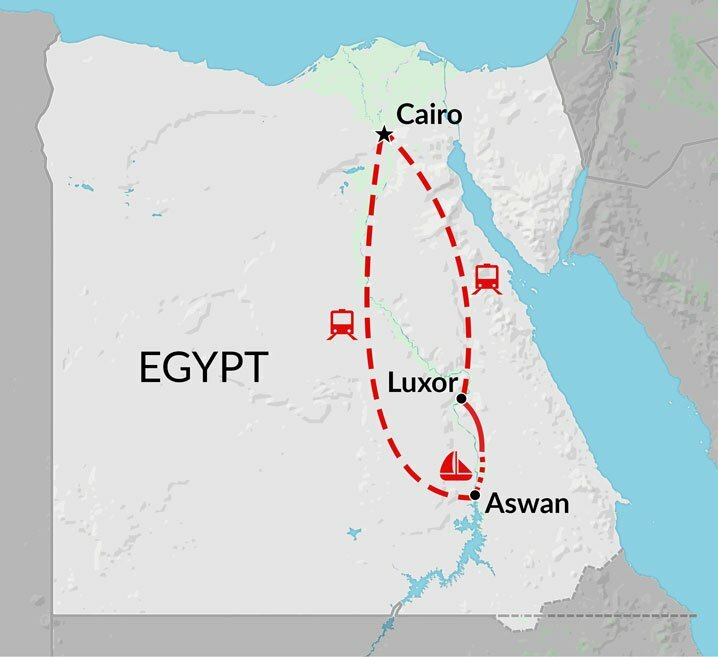 Finishing the tour of Egypt with time spent in Luxor is a must for amateur archaeologists with the nearby temples of Kom Ombo and Edfu certain to be a highlight prior to visiting the tombs of the pharaohs to be found within the Valley of the Kings. An overnight sleeper train back to Cairo signals the completion of this nine day tour of Egypt with chances to travel onwards into the desert or to discover Cairo or another Egyptian city at your leisure definitely worth considering if you’ve got time to spare. I cannot single out a particular part since everything was so exciting and wonderful: the pyramids and other ancient sites; the museum; the guide Mohammad Kemir, second to nobody; the superb food, both Nubian and Arab; the quality of the hotels; the night on Nile on board of felluca; the lovely people in the group - all these made the trip truly unforgettable!!! The company wants to show their country and cares for the tourist, so go ahead and book a tour! Do not pay attention of rumors and prejudice about safety: yes, Egypt is a safe place in this time! I hope part of our money went to local people, working in the industry. Given the tremendous number of plastic bottles for water thrown away I see negative impact on the environment - maybe the hotels should offer clean water in bulk and the tourist to refill their own bottles? deep winter. Everybody on our tour did not pack enough warm clothes. 5 out of 5! Amazing holiday! We visited Jordan and Egypt to take in the cultural and historical aspects of the countries and we were not disappointed. Amazing wonderful sights in perfect weather. If you book with this holiday provider you'll get unrivalled service, especially in Egypt and the experience at present due to lack of tourists is fantastic. Be prepared for some fierce heat, hat and sunscreen essential, also the local stall holders can be very persistent..one has to rember it's their livlihood and not take offence. Encounters Travel had organised the tour brilliantly. We felt safe at all times and the guides were knowledgable. Every detail was undertaken with great care and the transfers were executed very smoothly..eg Airport meet up, being dropped at the train station etc etc. I am about to visit Turkey with the same company and hope they keep up the same high standard..highly recommended!